Toyohara Kunichika (1835-1900) Newly Woven Brocades: Musashi Beauties; Beauty at Mirror, 1883. Oban. A very nice print indeed. Amy Reigle Newland, in Time Past and Time Present, Images of a Forgotten Master, Hotei Publishing, 1999 devotes an entire full page illustration to it. Aside from being an accomplished, indeed the leading, actor portraitist, Kunichika was a leading illustrator of women, and an innovator in that field. Classical, passive images of women from the eighteenth century had in fact given way to much more positive, urban images of women in real situations. Kunichika expanded on this by showing women in strong historical roles - as in Thirty-six Good and Evil Women from 1876 - and by showing contemporary townswomen in day to day activities, as in this series and others. In this way, Kunichika was hugely influential on Yoshitoshi who followed these groundbreaking prints with his own series such as Thirty-Two Aspects of Customs and Manners in 1888. In this series, the 'brocades' of the title refers to the richness of the successful multi-coloured printing that the publishers were now able to produce. These deluxe, sophisticated prints were widely known as 'brocade prints' (nishiki-e). The 'Musashi' of the same title, refers to the Musashi Plain that Edo is built on, (modern Tokyo). 'Musashi' was a term widely used in eighteenth century poetry and became synonymous with the romantic and self-regarding aspects of Edo life. 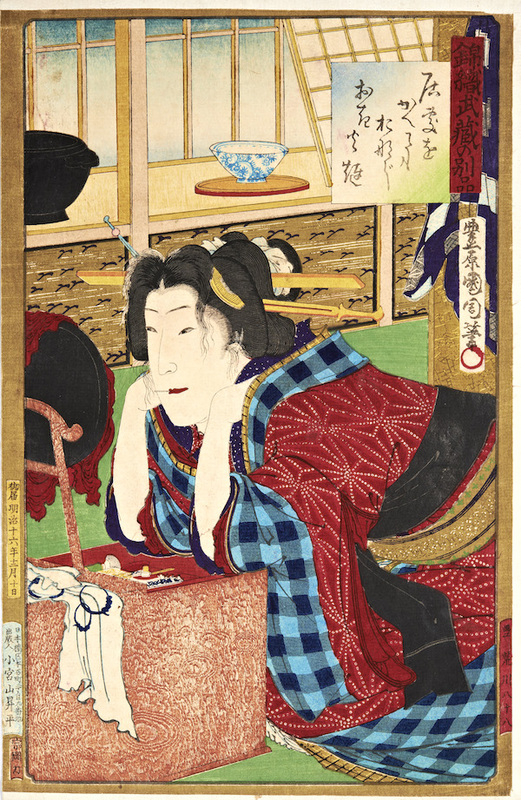 In this print, a modern Edo girl admires herself after her bath. She is looking into the mirror of a portable dressing table; the contents are visible as make up brushes and palettes. The hand towel draped over the mirror is printed with the Toshidama seal.